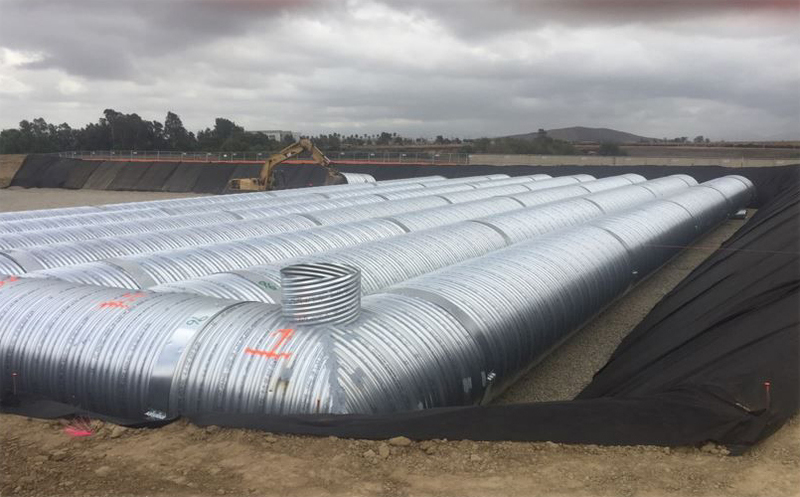 By Pacific Corrugated Pipe Co.
Pacific Corrugated Pipe was given the opportunity to value-engineer and aid in designing one of the largest rainwater storage retention systems ever installed in the Murrieta, Calif., area and furnished from its facility. This massive 122-ton project was created to capture 270,251 cu ft of rainwater storage in a single retention system. The contractor required an aggressive timeline and supplied Pacific Corrugated Pipe Co. with a purchase order on August 18, 2018, with a final ship date of October 18, 2018. This new detention system utilized more than 20 long runs that required several large elbows, stubs and tees to complete the system. The logistics of supplying the pipe to the project required 60 flatbed truck deliveries. In the end, more than 3,800 lineal ft of 96-in. 5-by-1 perforated 16-gauge corrugated steel pipe, massive fittings and bands were delivered in their completion within 18 working days from start to finish. For more information on this project, visit Pacific Corrugated Pipe Co. at its website.